Turn every smooth surface into a dry-wipe whiteboard - whether it is a large wall, a door, a cupboard or an old blackboard. 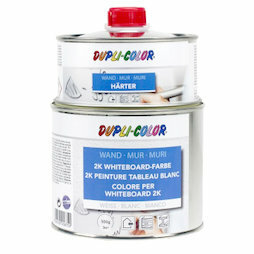 "DUPLI-COLOR Whiteboard" can be used indoors as well as outdoors, for instance in living spaces, classrooms, offices, hospitals, conference rooms, etc. - practically any place where a whiteboard is needed. Note: The magnetic paint needs to dry for 2 weeks before the whiteboard paint can be applied on top of it, which prevents uneven textures on the surface!